Progressive Rock quartet WEENDO formed in Agen, France in 2008. They are guided by the philosophy “without music, life would be a mistake” (Nietzsche). 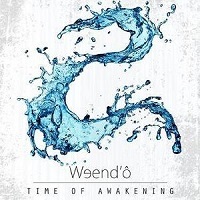 They are presenting their newly released album here titled “Time of Awakening,” which contains six tracks. The first movement of the title track is seven minutes long. It opens with a dancing electronic beat and melancholic tendencies. Laetitia’s vocals are soft and pensive. There is a steady building of Proggy electric guitars and some nimble meter negotiation. The keyboard solo is fantastic as well; creating a moody soundscape seemingly from another dimension. The second movement begins with a haunting piano melody, some toms and bass guitar notes. The vocals are very emotive and it seems to pull you along like riding a cloud in a dream. Indeed, the piano notes can be both gentle and ominous at the same time. It’s all about the atmosphere here; beautifully crafted. The final minute is ambient, segueing into the third and final movement; an eight minute opus. Skies darken and thunder is rumbling in the distance. The guitars and bass hold down the dark sound while held vocal notes give me somewhat of a CIRCUS MAXIMUS vibe. “Angel Dust” is the only stand-alone song on the album here without movements. Thwaking, walking bass notes provide the opening rhythm. Nathanaël marches on the snare drum gently, while they paint an ever-changing landscape of renewal and hope, while the cold of winter still clings to the coming of spring. The final song, “Elea,” has two movements. The first is a seven minute affair that opens softly and cautiously. The vocals are almost chants, with the melody repeated and steadily gaining sonority. Acoustic guitars provide the base while thoughtful lead guitar breaks shine above, with vocals that vary from gentle to more forceful. The textures sometimes remind me of the confident passion yet restraint that a band like RUSH plays with. The second and final part of the movement is a short three minutes, ending the album as it started, with a dancing electronic sound. It sort of closes the loop from the journey that the album takes you on, as you crest the green hill and take in the satisfaction that comes with the feeling of knowing that you are on the way home. The strength in the album lies in the compositional structure and texture. Nothing is sacrificed in favor of sophisticated, intelligent songwriting, beautiful melancholy, and haunting, pretty melodies. The band are fanciful musicians, but they don’t let this outweigh the synergy of the various instrumental parts in each track. Vocalist Laetitia has one of those voices that you just won’t easily forget. She sings from inside of her soul, extracting the elements that make her unique as a person into every sung note, like the famed Irish singer ENYA. This is an outstanding mosaic of Progressive music that every fan of the genre should hear.